Eager to get started? This page gives a good introduction to Flask. It assumes you already have Flask installed. If you do not, head over to the Installation section. So what did that code do? First we imported the Flask class. An instance of this class will be our WSGI application. Next we create an instance of this class. The first argument is the name of the application’s module or package. If you are using a single module (as in this example), you should use __name__ because depending on if it’s started as application or imported as module the name will be different ('__main__' versus the actual import name). This is needed so that Flask knows where to look for templates, static files, and so on. For more information have a look at the Flask documentation. We then use the route() decorator to tell Flask what URL should trigger our function. The function is given a name which is also used to generate URLs for that particular function, and returns the message we want to display in the user’s browser. Just save it as hello.py or something similar. Make sure to not call your application flask.py because this would conflict with Flask itself. PS C:\path\to\app> $env:FLASK_APP = "hello.py"
This launches a very simple builtin server, which is good enough for testing but probably not what you want to use in production. For deployment options see Deployment Options. Now head over to http://127.0.0.1:5000/, and you should see your hello world greeting. In case the python -m flask fails or flask does not exist, there are multiple reasons this might be the case. First of all you need to look at the error message. Versions of Flask older than 0.11 use to have different ways to start the application. In short, the flask command did not exist, and neither did python -m flask. In that case you have two options: either upgrade to newer Flask versions or have a look at the Development Server docs to see the alternative method for running a server. The FLASK_APP environment variable is the name of the module to import at flask run. In case that module is incorrectly named you will get an import error upon start (or if debug is enabled when you navigate to the application). It will tell you what it tried to import and why it failed. The most common reason is a typo or because you did not actually create an app object. The flask script is nice to start a local development server, but you would have to restart it manually after each change to your code. That is not very nice and Flask can do better. If you enable debug support the server will reload itself on code changes, and it will also provide you with a helpful debugger if things go wrong. it enables the debug mode on the Flask application. You can also control debug mode separately from the environment by exporting FLASK_DEBUG=1. There are more parameters that are explained in the Development Server docs. Even though the interactive debugger does not work in forking environments (which makes it nearly impossible to use on production servers), it still allows the execution of arbitrary code. This makes it a major security risk and therefore it must never be used on production machines. More information on using the debugger can be found in the Werkzeug documentation. Have another debugger in mind? See Working with Debuggers. Modern web applications use meaningful URLs to help users. Users are more likely to like a page and come back if the page uses a meaningful URL they can remember and use to directly visit a page. Use the route() decorator to bind a function to a URL. You can do more! You can make parts of the URL dynamic and attach multiple rules to a function. You can add variable sections to a URL by marking sections with <variable_name>. Your function then receives the <variable_name> as a keyword argument. Optionally, you can use a converter to specify the type of the argument like <converter:variable_name>. The following two rules differ in their use of a trailing slash. The canonical URL for the projects endpoint has a trailing slash. It’s similar to a folder in a file system. If you access the URL without a trailing slash, Flask redirects you to the canonical URL with the trailing slash. The canonical URL for the about endpoint does not have a trailing slash. It’s similar to the pathname of a file. Accessing the URL with a trailing slash produces a 404 “Not Found” error. This helps keep URLs unique for these resources, which helps search engines avoid indexing the same page twice. To build a URL to a specific function, use the url_for() function. It accepts the name of the function as its first argument and any number of keyword arguments, each corresponding to a variable part of the URL rule. Unknown variable parts are appended to the URL as query parameters. Why would you want to build URLs using the URL reversing function url_for() instead of hard-coding them into your templates? Reversing is often more descriptive than hard-coding the URLs. /myapplication instead of /, url_for() properly handles that for you. For example, here we use the test_request_context() method to try out url_for(). 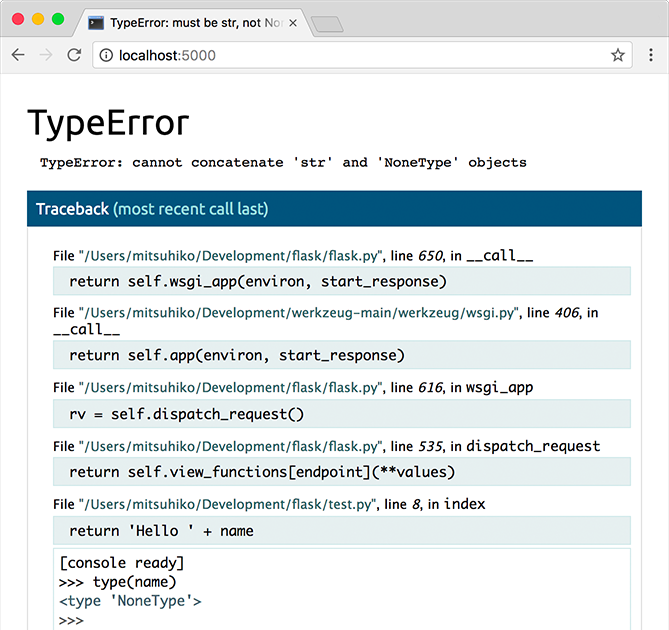 test_request_context() tells Flask to behave as though it’s handling a request even while we use a Python shell. See Context Locals. Web applications use different HTTP methods when accessing URLs. You should familiarize yourself with the HTTP methods as you work with Flask. By default, a route only answers to GET requests. You can use the methods argument of the route() decorator to handle different HTTP methods. If GET is present, Flask automatically adds support for the HEAD method and handles HEAD requests according to the HTTP RFC. Likewise, OPTIONS is automatically implemented for you. The file has to be stored on the filesystem as static/style.css. Generating HTML from within Python is not fun, and actually pretty cumbersome because you have to do the HTML escaping on your own to keep the application secure. Because of that Flask configures the Jinja2 template engine for you automatically. For templates you can use the full power of Jinja2 templates. Head over to the official Jinja2 Template Documentation for more information. Inside templates you also have access to the request, session and g  objects as well as the get_flashed_messages() function. Templates are especially useful if inheritance is used. If you want to know how that works, head over to the Template Inheritance pattern documentation. Basically template inheritance makes it possible to keep certain elements on each page (like header, navigation and footer). Automatic escaping is enabled, so if name contains HTML it will be escaped automatically. If you can trust a variable and you know that it will be safe HTML (for example because it came from a module that converts wiki markup to HTML) you can mark it as safe by using the Markup class or by using the |safe filter in the template. Head over to the Jinja 2 documentation for more examples. Changed in version 0.5: Autoescaping is no longer enabled for all templates. The following extensions for templates trigger autoescaping: .html, .htm, .xml, .xhtml. Templates loaded from a string will have autoescaping disabled. Unsure what that g object is? It’s something in which you can store information for your own needs, check the documentation of that object (g) and the Using SQLite 3 with Flask for more information. If you want to understand how that works and how you can implement tests with context locals, read this section, otherwise just skip it. Certain objects in Flask are global objects, but not of the usual kind. These objects are actually proxies to objects that are local to a specific context. What a mouthful. But that is actually quite easy to understand. Imagine the context being the handling thread. A request comes in and the web server decides to spawn a new thread (or something else, the underlying object is capable of dealing with concurrency systems other than threads). When Flask starts its internal request handling it figures out that the current thread is the active context and binds the current application and the WSGI environments to that context (thread). It does that in an intelligent way so that one application can invoke another application without breaking. What happens if the key does not exist in the form attribute? In that case a special KeyError is raised. You can catch it like a standard KeyError but if you don’t do that, a HTTP 400 Bad Request error page is shown instead. So for many situations you don’t have to deal with that problem. We recommend accessing URL parameters with get or by catching the KeyError because users might change the URL and presenting them a 400 bad request page in that case is not user friendly. For a full list of methods and attributes of the request object, head over to the Request documentation. You can handle uploaded files with Flask easily. Just make sure not to forget to set the enctype="multipart/form-data" attribute on your HTML form, otherwise the browser will not transmit your files at all. For some better examples, checkout the Uploading Files pattern. To access cookies you can use the cookies attribute. To set cookies you can use the set_cookie method of response objects. The cookies attribute of request objects is a dictionary with all the cookies the client transmits. If you want to use sessions, do not use the cookies directly but instead use the Sessions in Flask that add some security on top of cookies for you. Note that cookies are set on response objects. Since you normally just return strings from the view functions Flask will convert them into response objects for you. If you explicitly want to do that you can use the make_response() function and then modify it. Sometimes you might want to set a cookie at a point where the response object does not exist yet. This is possible by utilizing the Deferred Request Callbacks pattern. For this also see About Responses. This is a rather pointless example because a user will be redirected from the index to a page they cannot access (401 means access denied) but it shows how that works. Note the 404 after the render_template() call. This tells Flask that the status code of that page should be 404 which means not found. By default 200 is assumed which translates to: all went well. See Error handlers for more details. If a response object of the correct type is returned it’s directly returned from the view. If it’s a string, a response object is created with that data and the default parameters. If a tuple is returned the items in the tuple can provide extra information. Such tuples have to be in the form (response, status, headers) or (response, headers) where at least one item has to be in the tuple. The status value will override the status code and headers can be a list or dictionary of additional header values. If none of that works, Flask will assume the return value is a valid WSGI application and convert that into a response object. If you want to get hold of the resulting response object inside the view you can use the make_response() function. In addition to the request object there is also a second object called session which allows you to store information specific to a user from one request to the next. This is implemented on top of cookies for you and signs the cookies cryptographically. What this means is that the user could look at the contents of your cookie but not modify it, unless they know the secret key used for signing. # Set the secret key to some random bytes. Keep this really secret! The escape() mentioned here does escaping for you if you are not using the template engine (as in this example). A note on cookie-based sessions: Flask will take the values you put into the session object and serialize them into a cookie. If you are finding some values do not persist across requests, cookies are indeed enabled, and you are not getting a clear error message, check the size of the cookie in your page responses compared to the size supported by web browsers. Besides the default client-side based sessions, if you want to handle sessions on the server-side instead, there are several Flask extensions that support this. Good applications and user interfaces are all about feedback. If the user does not get enough feedback they will probably end up hating the application. Flask provides a really simple way to give feedback to a user with the flashing system. The flashing system basically makes it possible to record a message at the end of a request and access it on the next (and only the next) request. This is usually combined with a layout template to expose the message. To flash a message use the flash() method, to get hold of the messages you can use get_flashed_messages() which is also available in the templates. Check out the Message Flashing for a full example. Sometimes you might be in a situation where you deal with data that should be correct, but actually is not. For example you may have some client-side code that sends an HTTP request to the server but it’s obviously malformed. This might be caused by a user tampering with the data, or the client code failing. Most of the time it’s okay to reply with 400 Bad Request in that situation, but sometimes that won’t do and the code has to continue working. You may still want to log that something fishy happened. This is where loggers come in handy. As of Flask 0.3 a logger is preconfigured for you to use. The attached logger is a standard logging Logger, so head over to the official logging documentation for more information. Read more on Application Errors. Extensions are packages that help you accomplish common tasks. For example, Flask-SQLAlchemy provides SQLAlchemy support that makes it simple and easy to use with Flask. For more on Flask extensions, have a look at Extensions. Ready to deploy your new Flask app? Go to Deployment Options.